Add some extra storage to your log cabin or rustic themed home with this Amish Red Cedar Log Corner Hutch. The corner hutch design allows you to nestle your cabinet into any corner of a room utilizing the often unused corner space, while providing plenty of extra storage. The slab fronts and raw edges bring a rustic feel to the room and is the perfect look for any log cabin, rustic home, or hunting lodge. The unique red cedar logs are the standard wood type for this corner cabinet, but is also available in rustic pine or aspen wood for a variety of custom looks to match your home. If this style isn't for you, we also offer a wide variety of Amish corner hutches in different sizes, shapes and styles. 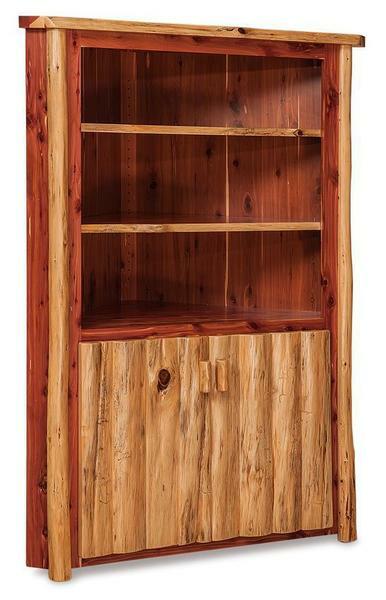 Please call for additional information or custom ordering assistance on this beautiful red cedar log corner hutch.